Energy corporations, electricity supplier or governments ? none of them, because for them high energy price means high incomes. Worse, all your saving-efforts are in vain (saving bulbs, cars, heating) because your savings will be canceled - with the next increase of energy prices. But the necessity is the mother of invention, and invention is based today on technology. Who really takes care about your energy costs is You, yourself. The amount of produced energy in PhotoVoltaics and Thermal Solar Systems is calculable and known for the next 25 years (PV solar panels warranty), over this time and probably much longer, the price for solar electricity is limited to the system costs. The electricity can be produced at the place of consumption, but the significant innovation is transformation from consumer to producer of own and clean energy. It breaks the system dependency and your saving efforts become real, are your profit. The PV technology can be mounted almost anywhere and is also neighbor-friendly, what in the practice may have considerable importance, especially in strong urbanized locations. In PV Off-Grid and thermal solar systems, the system planning and sizing depends basically on your energy demands. In sequence: energy demand > storage capacity > system power (see information about pv off-grid systems and installing PV solar systems). In case of PV On-Grid systems, the system sizing depends on profitability, the energy price or feed-in tariff, available mounting area and approved or connectable PV power. For inclined roofs approx 25kg/m² (range 15-30kg/m²) or ca 180kg per 1kWp installed PV power. The needed mounting area for an 1kWp PV system in crystalline technology will be around 7m². For flat roofs approx 50kg/m² (range 7-70kG/m²) or ca 360kg per 1kWp installed PV power. The area-use ratio is about 30%, ie. from 100m² flat roof or land area, can be approx 30m² PV surface area mounted and an 4kWp PV system in crystalline technology. For thin film PV technology the applicable PV power will be around half less, or the needed mounting area (PV surface) and system weight twice big. During planning your home, it's recommended that the floor heating system is used, which can be well and effective supported by the solar systems (heating pump, PV and mainly by thermal solar systems). The difference between a conventional radiators and floor heating system, is that the floor heating operates at 27-33C degrees, and a conventional radiators around 55-60C therefore twice as high. Solar collectors or even PV based heating systems can effective support the floor heating system, especially in autumn and spring. Development of European regulatory requirements for the grid-connected PV systems confirmed also the trend, that preferred mounting locations are on the roof, to the detriment of the ground and free-land mounted systems. This can be also an important determinant for future planning and architectural arrangement of PV systems. additional roof statics approx 50kg for 1 installed collector (40kg collector, 10kg mounting system). For 2 collectors 100kg, for 3 collectors 150kg etc. optimally angle for thermal systems is 40-45° (PV 30°) and results from focus on energy yields in autumn-spring period. In summer almost every thermal system produces unused excess of energy and in this period optimal system-inclination is secondary. Exception are industrial thermal systems or pool connected, where excess of energy does not occur, in this cases system-inclination ca 30°. What if an optimal PV system orientation not possible? Then the annual energy yield will be less, according to the table below. The correction is defined by the reduction of the annual energy yield (kWh/year) in percentages, ref. Central Europe. Example in an optimally designed PV system, an ratio of 1:1 is possible (1000kWh/year from 1kWp PV installed), then PV system with 60' south-west orientation and 40' roof inclination will reach approx 90% of annual energy yield, in this case 900kWh/year from every 1kWp installed. 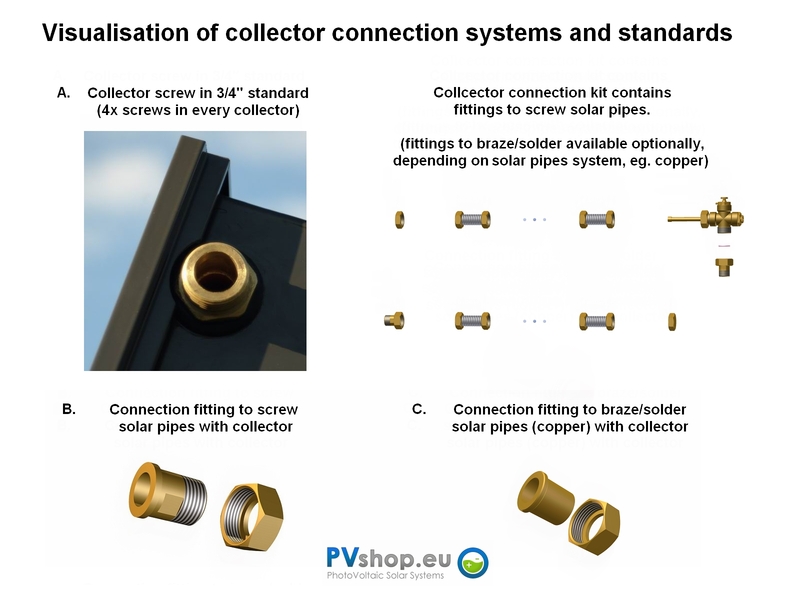 In general deviations in the system inclination between 0-45° are not problematic and can be compensated by the expansion of installed power, additional panels or solar collectors (this applies particularly to the thermal solar systems). However, missing south exposure of the system can not be compensated, but deviations in azimuth between south-west and south-east are also not a problem, reduces the yearly energy yields at about 10%. A useful tool in determining the system's location can be the GoogleMap, helps to determine the south exposure of roofs. The most influence on buying decision should be the profitability and the quality of the system. Any investment in renewable technology is oriented for an long-term period. The advantage is, the long operating period, the higher your profits, economic and ecological. Low-quality product and even extraordinary energy performance are worthless, if designed for short or even middle-term operating time. Proven technology, solid and simple solutions in attractive price-performance-ratio are the goal. There are very few (3-4) renowned producers, whose products guarantee consistent high performance and trouble-free performance over years. An PV inverter failure belongs to the most frequent fault in the whole PV system and in worst case can be quick and easy replaced. PV inverters are very important for any PV system, but proportionally to the whole system costs, relatively not very expensive. Similar for charge controllers where max two producers of high quality products offer excellent products. The burning-out problem is here much more common, than within the PV on-grid inverters, but the burning-out problem does not mean an pure fire, stands more for electric failure of the device. Important is that it is solid, firm and simple. For inclined roofs, until recently strong undervalued function was the ventilation function, of the PV generator. This brings with high-quality mounting system up to 10% more in annual energy yields. The mounting systems for sloped roofs are usually available in two versions. An dual-layer (double-layer) system, mostly high quality and optimized for efficient ventilation/cooling of the PV generator. An economic version is an one-layer (single layer) system, here is the PV generator usually a bit closer to the roof (through one-layer-mounting-profile) and thus lower volume of the gravitational/ventilation and cooling. In-roof installation, integrated into a inclined roof, is not practiced by experts, mainly by the lack of ventilation (no gravitationally cooling) and thus high losses in system efficiency and penetrating roof structure results also often in leaks, visible after years. The coatings (silver or dark) is an purely esthetic aspect. But an unified dark color-coatings, according to the PV modules frame is today also an quality standard. The PV modules are one of the most important components of the PV system, even if failures and dysfunctions are rare. Technical selection and priority of parameters are well known, but the long-term performance, durability and quality is a matter of experience. An extraordinary high performance is important, but must be related with the proven longevity of the technology. An long term warranty is also important, but take effect when the company exists within the next 25 years. The greater the PV system or investment, the higher the risk, of low quality PV modules. The problem of microcracks results from the property: the thinner the PV cell the more efficient is it. Mainly, low quality production (cutting the ingots into cells and their further processing) results in microcracks. But microcracks are a natural phenomen and occur almost in all modules, but in high-quality modules are rare. In practice in the flash-list given peak-power (Wp) will be reached, but the current (A) that stands for the "real" electricity, will decreases extraordinary over the first years of use. Especially in On-Grid systems, that means lower energy yields, incomes and profitability. The microcracks are particularly significant in Europe, where high temperature differences between summer and winter, reinforces the expansion of the cracks. In countries with a quite constant temperature, the problem is not so serious. That is also why PV modules are divided into categories A to D. On of the reason why the category D is mainly designated for countries with constant temperatures, but in practice sometimes to find in Europe in excellent pricing (sometimes illegal relabeled). To find out if microcracks occur, it would be cost probably more, then the cost of the given PV module, especially in PV off-grid systems (small PV modules), where the problem is very common. Therefore, the correct choice for high quality and reliable source of your PV modules, but also other PV components, is extremely important. A significant advantage of pre-configured solar kits (solar sets) are the included components. Its optimal set-up of the main components within the PV system, which allows the avoidance improper quality divergences within the system. Due to the known dimensions and arrangements, it is also easy to plan and build up, connecting as an modular system. Enables to save money and time. The profitability of a grid-connected system depends on the produced energy expressed in kWh. The fundamental question is: how much energy produces a system and how much is this energy worth. In central Europe the expected average electricity production (in kWh) from a grid-connected 1kWp installed and optimally arranged PV system may vary between 850-1150 kWh. Main influences on this value are: geographical location, system arrangement, quality and ventilation (mounting system) as well as mounting quality. Weather changes may have influence on the production of electricity, but in practice for grid-connected systems and their annually energy yields are secondary. The electricity generated is quite constant and over 25 years (warranty for solar panels) mainly affected by degradation process at around 1% per year (PV panels, inverter). Annually average 1.000kWh per 1kWp installed PV power. How much are worth 1.000 kWh? and how much will it be worth in 25 years? excellent question, we will take care about answer to the first part. The feed-in tariff has for PV systems the advantage, that the produced energy, or in case of self-consumption the unused excess of electricity can be sold into the local grid. The profitability of such systems depends on the feed-in-tariffs, price for the solar electricity, which can be different in the European countries. The PV system costs may vary, but can be set at around 2.000EUR for 1kWp (2EUR/Wp). 1000kWh x 0,2 EUR = 200 EUR x 25 years x 0,9 degradation ratio = 4.500 EUR / 2.000 EUR system cost = profitability, after around 10 years. But this calculation has one fundamental error, will the price for electricity (0,2 EUR/kWh) over the 25 years constant ? Rather not. If in the next 25 years the price will increase to around 0,4 EUR/kWh, the profitability of such system will be almost double high. It is also very possible that after 10 years the system payback time, and the price for conventional electricity will be almost double high as now, transferring the solar electricity to the grid will be secondary important and the self consumption much more interesting, because after the payback time (after around 7-10 years) the generated solar electricity will be for the system owner almost for free, so long as the system will still work up to the expected 30-40 years. That's why an PV system is an smart investment, combining the ecological technology and profitability, practical link of ecology and economy. In the net transfer system, the solar electricity is not sold into the local grid, but can be transferred and received back when needed, in the given time period (months, year) and usually after deducting the grid management costs. Billing is based on comparing the electricity meter (in/out) and is calculated by the kWh. Refund for transferred energy will not occur. In this system it's important to ensure, that your PV system is properly sized, according your annual electricity consumption. It shouldn't be oversized, because the excess of transfered and unused (received back) energy, in the given periods will be not refunded. An to small PV system, will not cover fully your annual electricity consumption. Here is important to calculate your anual electricity consumption and at annually eg. 5.000kWh own electricity consumption, you will need a PV system that is capable to produce (at your location) the required 5.000kWh, plus eventual grid management costs. The system costs may vary, but can be set at around 2.000EUR for 1kWp, or 10.000EUR for an 5kWp system. annual electricity generated x 25 years x 0,9 degradation ratio / system cost = profitability. 5.000kWh x 25 years x 0,9 degradation ratio = 112.500 kWh x 0.2 EUR / 10.000EUR system costs = profitability after around 10 years. But this calculation has also one fundamental error, will the price for electricity (0,2 EUR/kWh) over the 25 years constant ? Rather not. If in the next 25 years the price will increase to arround 0,4 EUR/kWh, the profitability of such system will be almost double high. Then the more expensive the electricity, the bigger your profit and your system profitability. For stand-alone systems (PV Off-Grid) the profitability is defined by the independency from external electricity sources. The question is: how much worth is this independency ? it will be a different priority for each of us. Because the price for electricity in the middle of ocean, high in the mountains, at not-electrified places, or just at home for self consumption, will be an different. The PV system is sized according to the needed electricity and storing it in the battery (Ah). Additionaly the seasonal solar radiation, in daily sunlight hours specified must be calculate according the system usage mode, all season, in spring-sumer-autumn period or only in summer? Technically the most difficult here is the system integration of batteries, which are currently the most expensive and weakest component in the whole system. General profitability in PV Off-Grid systems begins from the first day of usage, every working day means an profit and independency from other energy resources. How much you can save, depends on your hot water or heat consumption. The more you need, the higher is the profitability. In case of system supporting floor heating there are additionaly savings, and for pool heating there is no better alternative. Thermal solar system prepares hot water over the whole year. Especially during the summer months reach an 100% hot water demand coverage (up to 70-80°C). But even in the summer it can occur some sunless day. In this case an external source of heating water is needed, mostly based on gas, oil or electricity. In this time and especially in autumn spring periods, the thermal solar system supports the production of hot water by preheating and means also a significant saving. Because prewarming water in lower temperature range (0-30°C) based on gas, oil or electricity, is most cost intensive. Standard thermal solar system allows to cover 60% of annual heat water demand. It means savings of 60% annual costs to preparing of hot water and amortisation after approx 6-10 years. In combination with the national and local financial support programs, the savings will be higher. Significant advantage of solar systems is, they can operate almost maintenance-free. It does not mean that maintenance should be omitted, no - in fact an annual inspection of the system, before summer is recommended. But in general there are no costs for wear materials, except the PV inverter with expected 10-15 years operating time (concerns mainly small power inverter) and in the thermal systems: solar fluid and the anode, exchangeable every few years. Damage to the components are rare. In PV system the weakest component may be the inverter and in thermal systems the solar heater. Each user can at any time perform simple check, which is mainly based on a visual inspection of the solar system and its components. Other inspections especially loose parts within the mounting system (mainly between roof hooks and profiles), the connections on the DC/AC site, strings and grounding measurement, lightning protection or overvoltage protection should be conducted by an specialized PV installer. Other inspections, especially check of the magnesium anode in enameled tanks and its replacement (every few years depending on water hardness), solar system rinsing and solar fluid exchange should be conducted by an solar installer. The mounting quality in case of thermal solar systems has an very high priority. The main problem is to master the high temperatures and pressure of the system (up to 6 bar and more). They rarely occur during the installation, the weak points will be obvious much later, during extreme operating conditions and after peak working periods, during the cooling down of the system and its shrinking (disclosure of leaks). Most of the operating problems results from the system aeration (air in the system) which depends mainly on the mounting quality and sometimes system oversizing. To much heat from solar collectors in the summer time versus to small ability to receive energy (to small tank), resulting in overheating the solar system, especially the solar fluid. This can be avoided through optimal system selection and optionally connection with pools or industry applications. An solid thermal solar system is high temperature resistant and in the summer overheating is an natural phenomenon in every thermal solar system, when the given temperature in the solar heater is reached and the solar circulation pump will stop to work. But the sunshine appear to continue, then the temp in solar collectors will increase, up to ~160°C and 4-6bar pressure, and the excess of pressure and glycol volume will be transferred into the pressure vessel. In this case (~160°C) the solar system is not able to work, because system physically areated. The solar pump is not able to circulate and under high pressure and temp glycol converts to gas (system areation). Even if the temp within the solar-heater will drop (consumption of hot-water) and the solar pump start to work. During this time in approx 160°C (boiling point of glycol)every thermal solar system is physically "blocked". At the evening upon cooling the system, will change back (gassed glycol converts back to solar fluid/glycol) and the system returns back to normal operating position. For an high quality thermal solar system an overheating is an natural phenomenon and occurs in a well composed system (not oversized) a few times a year. But such extreme high temperature within solar collectors (160°C) may scare every user and indeed it is an stress to the system. 1. use reverse circulation (feature within the control unit): in this case the controller will start the circulation pump, using the temp differences (at night) within the water-heater and collectors on roof. So cooling the system at night by circulation. This is possible only by using flat-plate collectors, which are able to release the heat-power. Very useful function when you are absent or in vacation. 2. Increase the default max hot water temp (settings within the control unit): the default max temp is around 60°C (default setting within the controller), in an high quality water heater (boiler) the max. allowed temp is around 80°C. This allow to increase the working time (circulation) of thermal solar system and so delay or avoid the effect of overheating. The key point here is an high quality solar heater dedicated for solar systems and high temp. Standard water heater operating at max 60°C are not able, to withstand 80°C temp for long time. 3. Connect your thermal solar system to swimming pool or an external energy receiver (industrial applications). Correctly designed system works properly without problems many years and without wear. Exceptions are: solar fluid and magnesium anode (in enameled tanks), which should be exchanged every few years (3-6 years). The overheating aspect, may occur few times in a year and an thermal solar system is designed to withstand this conditions. Heating home with a PV system ? Generally not, due to differences in the system efficiency. Thermal collectors 80%, and PV modules approx. 14% efficiency. In practice that means that to achieve an power of 4.5kW of energy, requires surface of solar collectors approx 6m², and PV technology approx 33m². But due to the price drop of PV technology and in some countries, specific structure of the feed-in-tariff (preferred self consumption above 30% of generated electricity), it may be interesting. But nowadays from an economic point of view, it is preferred to produce hot water on the basis of thermal heating solar systems. The differences in the efficiency are to big, differences in prices of technology also. Solar thermal systems are about half cheaper than the PV technology, calculated in EUR per 1Wp. The PV technology produces a very universal energy - electricity, which is much more useful and transferable, than the thermal energy. But each solar system during the winter months has an supporting character, that should not be forgotten. This is probably the most common cause of dysfunction in a photovoltaic system. A PV inverter is subject to wear and may be sensitive to external influences such as heat, dust, moisture, etc. Furthermore fluctuations in voltage or current problems, both from your PV systems, as well as from outside, such as nearby firms, farms, biogas plants or wind turbines. If an PV inverter fails after a relatively short period after start-up your PV system (under warranty) you lose usually the feed-in tariff during the downtime. After the warranty period an replacement inverter, generally is an small part of costs, compared to the whole system costs. If there is a failure indication (on the display of the inverter), the error code can be interpreted according the user manual. There are often displayed codes only for references or operating system status, that have nothing to do with dysfunction of the photovoltaic system. E.g. morning and evening when the inverter is in on or off status again (indicated by yellow or red LED's). This may also appear, if an PV inverter operates at its limit of the rated power range. If this message appears only in the cold but sunny and clear days, that's absolutely normal. If this message appears in the hot summer days, the inverter is probably undersized. Adjustments and maintenance of PV inverters, should be made ​​by specialized professionals. While a grid failure the inverter will immediately, within milliseconds, interrupt the transfer of electricity into the local grid. The PV inverter monitors the local grid and until recovery of the local grid parameters (eg. Hz frequency), transfer of electricity will be resumed. The modules are cleaned by rain, when they are mounted on a inclined roof there is an self-cleaning effect. Leaves from nearby trees should be removed, if firmly fixed. Shadowing of individual cells of a module, has significant influence on energy yield losses and may result in hot-spots. Every five years, the modules should be checked in general inspection. The degradation of the modules (decrease in efficiency over the lifetime of the modules) should be noticeable after several years, except for thin film modules. If the PV power goes back in a shorter time, the system should be examined more closely. The simplest reason may occur through extraordinary contamination of the modules, especially for systems operating in the vicinity of factories, agricultural or railway. Otherwise, If no errors are found, the modules should be "flashed" by the manufacturer or at an laboratory, so their performance can be determined. If similar strings (within the PV system) are unshaded and otherwise the conditions are equal and the different performance occur shortly after installation, the most obvious is that a module has been forgotten to connect. This happens more often than you think. Hot-Spots are areas in the solar cells (within a module) resulting from permanent shadows on the solar cell. It occurs in the solar cell an ohmic resistance and heat, which can lead to damage or even destruction of the cell. To reduce this effect, it can not be completely avoided, in the PV modules are installed protecting bypass diodes, which disconnects the faulty circuit. An hot spot can be detected as a brownish stain and can burn even through the cell and the module rear wall (eg. in similar size to an 1or 2EUR coin). The problem can occur in modules located very close to pipes or antennas as source of permanent shadows, which should be avoided at all cost. PV - Glass breakage occurs primarily when one or more modules are mounted without strain, without avoiding the accordance with thermal expansion. This happens especially if the installation instructions have not been met. Under heat the framework of modules and mounting system expand upon heating, adequate clearances must be maintained. If modules are mounted directly to each other without a gap, problems are inevitable. The same applies to the mounting system. The rails must not exceed a maximum length specified by the manufacturer. Faulty installation may take some time to be perceived by later module glass cracking or creaking of the mounting system or PV modules. Glass breakage often occurs during the first year after installation of thin-film modules and in this time visual inspections are particularly recommended. Here it is again noted that a cross-bar assembly helps to counteract this phenomenon. Thermal - In the case of solar collectors, the flexible connections of solar collectors adapt the thermal expansion. But the max. amount of connected solar collectors in one section (collectors battery) should not exceed 8 solar collectors. If needed, another section of solar collectors can be created, up to the next 8 solar collectors in one section. The sections can be connected with an elastic dilatation of several cm (25-50cm) eg. to an industrial (bigger) thermal solar system. The modules are mounted of hardened special glass. It is bombarded with ice balls for testing purposes, according IEC standard, which are carried out with ice balls of 12.5 mm to 35 mm in diameter and the impact velocity has a maximum value of 140 km / h. Therefore hailstorm means low risk for PV modules and may have an cleaning function. Tracking system allows to receive up to 30% more energy yields, because the system tracks the sun continuously. It should be weighed exactly which PV technology will be mounted on the tracking system. There are technologies where direct sunlight is preferred, ideally for higher energy yields, then there are PV technologies, which would not use it efficiently. An tracking system for flat roofs are also not recommended and the financial benefits of higher energy yields with the higher costs for construction and infrastructure need to be calculated. Generally tracking systems have advantages in middle and large scale projects, where the maintenance of such systems is subject to an scale effect. For single tracking systems, due to the high integration costs and maintenance (motors, software, monitoring) are rarely recommended. Usually installed for esthetic purposes - there is no doubt, looks definitely modern and futuristic. Insurance of your PV system? An important component of any PV system is it's insurance. Already from the time of delivery or after takeover from installer ? It is important to clarify the insurance, before mounting the system. Extremely rarely happens, but it can not be excluded, eg a lightning strike during the mounting works, in unfinished PV system, then who is liable for this damage? General your PV system should be covered by an home or property insurance, usually requires a message to your insurance company and his confirmation in written form. The most harm can result from lightning, over voltage or fire. Eventually technical defects of the system components are covered by producer warranty.